Selangor, Thursday, 12 June 2014 - Suzuki Malaysia Automobile Sdn Bhd (SMA) introduced its sprightly new Swift RS to the Malaysian market today. Sharing the same DNA as its predecessor, the 1.4 Litre Swift RS is a sporty compact that has benefited from a bright splash of colour and technological enhancements. This new variant of the popular Swift model delivers the same dynamic performance but with even greater flair. The Swift RS features an eye-catching black and red gradient rooftop, side body decal, stylish red lining on the body-kit with an additional back spoiler, LED Day-Running-Light, 16-inch ‘gun metallic’ aluminium-alloy wheels and the RS emblem to complete the look. 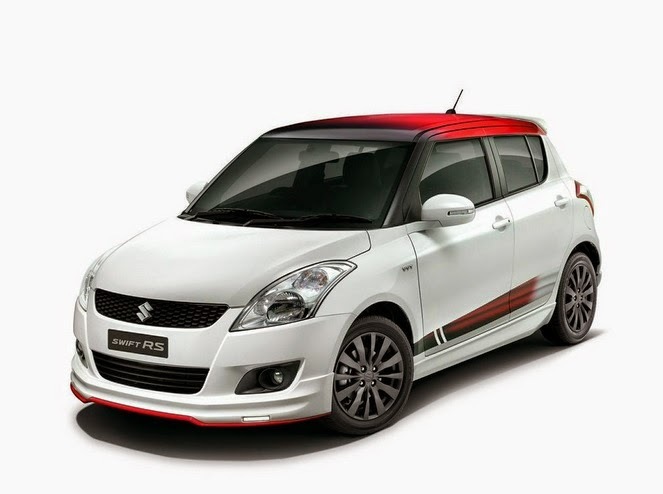 “In line with Suzuki’s brand philosophy of delivering excitement, the Swift RS brings stand-out style to Malaysian streets and appeals to youthful drivers wishing to reflect their vibrant personality in their car’s appearance,” said Mr. Keiichi Suzuki, Managing Director of Suzuki Malaysia Automobile Sdn Bhd. The interior of the Swift RS is sporty and fresh with black and red leather seats and red stripe side-door trims. This latest variant also features a 2-Din touch-screen audio system with reverse camera, Bluetooth system with microphone, and True Mirroring with Smart phone* (*additional items required). “Being such a popular model with the younger Malaysian market, we have customised the Swift to suit the latest trends – with a pop of colour, sporty features and new technology,” added Mr. Keiichi. This 1.4litre-petrol-engine vehicle has a maximum output of 95PS (70kW)/6,000rpm and maximum torque of 130Nm/4,000rpm. Its standard Swift features are worthy of highlighting too: LCD display dashboard, telescopic steering wheel, keyless transmitter and push-start system and SRS airbags. The Swift RS is available with Automatic Transmission at the sensational price of RM 79,388.00 – On The Road (OTR) without insurance for Peninsular Malaysia, RM 85,140.00 for Sarawak and RM85,124.00 for Sabah. The Swift RS comes with 3 years warranty or 100,000km (whichever comes first), with the exception of the RS rooftop sticker, which has a 2-year warranty.